Jaws doesn’t have to worry; The Meg won’t be unseating it from atop the shark movie heap anytime soon. Not that anyone expected it to, of course, but a little fun would’ve been nice. Unfortunately, The Meg is the type of movie where it’s abundantly clear no one involved in the production cared; well, almost no one. Five years ago, rescue diver Jonas Taylor (Jason Statham) encountered a monster and made a decision that cost him his friends, his marriage and his sobriety. Now, when a high-tech underwater exploration facility faces a similar beast, Taylor must once again take on the Meg and prove himself a hero. The most startling thing about The Meg is how poorly filmed it is. The camera never stops for a moment; it’s either gliding along so we can’t focus on the characters, quick-cutting so we can’t get a good look at the action, or shaking so we know the Meg collided with a boat. As a result, scenes that should be exciting are dull, and we wish we could get back to watching people standing around talking. Likewise, the moments clearly intended to invoke awe fall flat; at one point someone exploring the unknown depths of the ocean (a scene that is a far, lamentable cry from James Cameron’s majestic The Abyss, which it’s clearly invoking) asks her buddies back at home base, “Are you seeing this! ?” and you’ll wonder why no one thought the audience should. That’s a shame, because while the plot is very basic (save humans, fight dinosaur shark monster), the film is a structural mess. There isn’t an ounce of tension or buildup; the Meg just occasionally appears, sometimes as no more than a blip on a radar screen. There isn’t even an escalation in deep-sea threats leading up to the Meg (the opportunity for which appears and is quickly discarded). The deaths aren’t parceled out in a way that keeps the audience in suspense as they wonder who will be the monster’s next meal, leaving long stretches of a toothless shark making little more than a nuisance of itself. If Jaws made you afraid to go back in the water, The Meg makes you want to leave it out of sheer tedium. 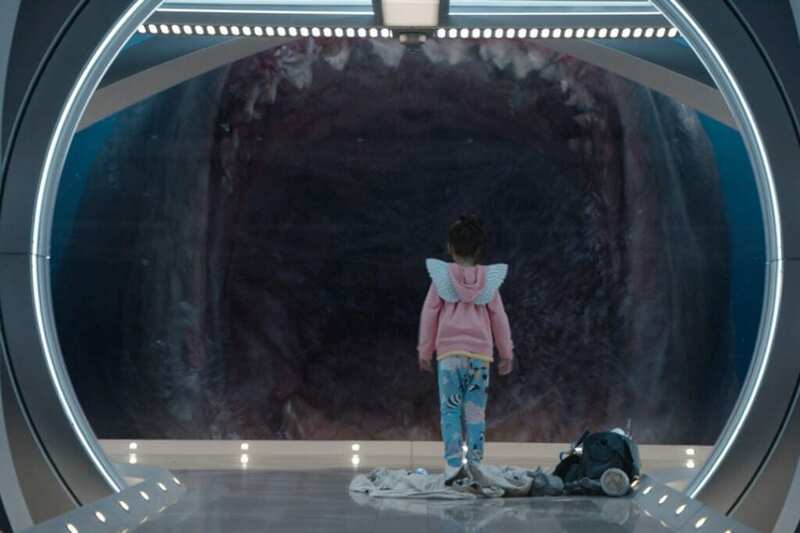 Not that it would be particularly easy to care about most of these characters, as The Meg spends no time developing relationships – with one exception. For example, the opening scene shows Taylor’s ill-fated first encounter with the Meg (or a Meg, anyway), but the loss of life is meaningless because not only do the doomed divers mean nothing to us, but we get no inkling of what they mean to Taylor, or even to each other. Why not open with the team en route to the downed sub and have them crack jokes and pal around with one another? These characters don’t have to be all-timers – they’re about to be shark food before the plot even kicks in – but seeing some proof that they’re actually friends would make us more invested in Taylor’s guilt, and the anger of those surrounding him. The rest of the movie isn’t much better on this front (although it bizarrely spends an inordinate amount of time with some random beachcombers, probably because the beach is in China, Hollywood’s favorite new market). The exception is the burgeoning romance between Taylor and Suyin (Li Bingbing), one of the scientists at the beleaguered facility. Their scenes together are fun, cute and kind of believable. Sure, it’s obvious, and the surrounding characters deflate it a little with their ridiculous running commentary, but their flirtation provides the only bit of humanity in the movie. Most of this is due to Statham and Bingbing, who play off each other well. Statham, in particular, is a real trooper, giving his all to a movie that seems determined to let him down. He’s got a natural charisma that makes you smile even in something like The Meg, and while he’s still playing Jason Statham, that’s really the point. Bingbing isn’t quite as good during the tenser moments, but she makes her lighthearted scenes with Statham work. The rest of the cast is mostly just taking up space. Cliff Curtis is only around to deliver exposition (somebody has to tell Suyin that Taylor is totally over his ex-wife despite the subject never actually coming up). Rainn Wilson is obnoxious and never once funny (to be fair, I don’t typically like him, so your mileage may vary, but I doubt it); ditto Page Kennedy. Ruby Rose does computer stuff, and we know she’s good at it because her hair is buzzed and she has tattoos. Robert Taylor’s job is to dislike Statham. Winston Chao is very serious, just in case we forgot that the Meg is dangerous. Shuya Sophia Cai is another one of those wise-beyond-her-years movie kids that end up grating on your nerves. 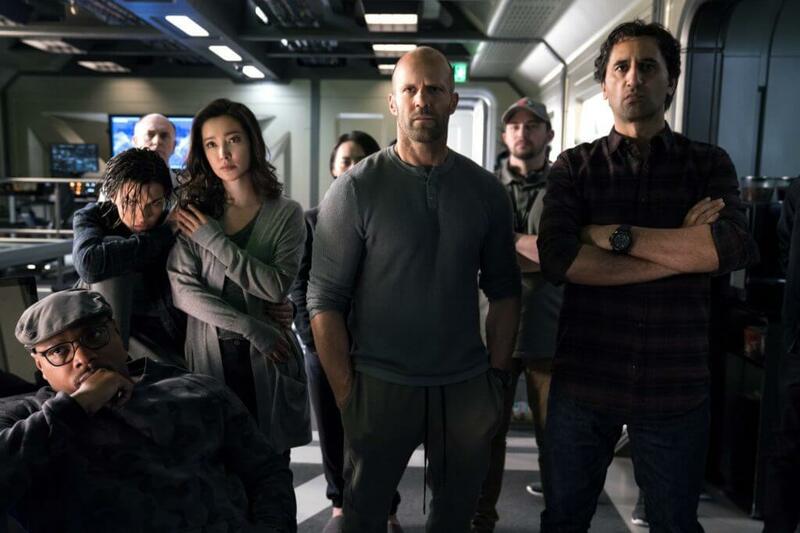 I’d be hard-pressed to hold The Meg against any of them, and the problem is more that they’re given nothing to do than the performances themselves, but that doesn’t make spending the better part of two hours with these characters any more enjoyable. The music is standard-issue monster movie fare, complimenting the poor action well enough but not leaving any kind of lasting impression. During a sequence where Suyin is exploring the ocean’s depths (prompting the “Are you seeing this! ?” invitation for us to respond, “Nope.”) and the score becomes more operatic, making the lousy editing and cinematography even more apparent. The special effects are fine; nothing terrible, and nothing to write home about. The Meg’s design is kind of neat, although one wonders if at least some of the shoddy camerawork is meant to disguise lackluster effects. But, then, the other sea life looks real enough, so maybe it’s just bad filmmaking. The Meg is a late-night shrug watch when there’s nothing else on Netflix, or wherever it ends up. It’s too incompetently filmed, too lazily plotted, too populated with empty characters and too flat-out dull to warrant a trip to the theater – unless, of course, you’re a Jason Statham fanatic like me. If you’re really curious and want to see if it’s just bad or so bad it’s good (I’d put it in the former camp myself), wait till you don’t have to pay (specifically) for it. The Meg is a late-night shrug watch when there's nothing else on Netflix, or wherever it ends up. It's too incompetently filmed, too lazily plotted, too populated with empty characters and too flat-out dull to warrant a trip to the theater – unless, of course, you're a Jason Statham fanatic like me.